One of my intentions is to learn how to make videos. This week I experimented with painting a series and at the last minute, decided to record the whole thing. After a few minutes finagling my phone into position and several hours playing with video apps I condensed 56 minutes of footage into something a bit more palatable. The result is a seven-minute high-tempo music-filled glimpse into my process as I scribble and scrape and paint and scrub and learn my way into creative bliss. I share it here in spirit of discovery. PS - If this sort of thing interests you I invite you to join me on my Facebook page, Stephanie Guimond - Unfolding in Art and Life, where I share more frequent glimpses into my artsy and creative life. In addition to its many smaller art galleries, Ottawa is is home to – or within a reasonable train ride to – several major galleries and museums that offer large-scale, international exhibitions. Often at the beginning of a new year I check out my list of usual suspects to see what’s on or what’s coming up. I keep this in mind when I’m in the mood for an art-related adventure. 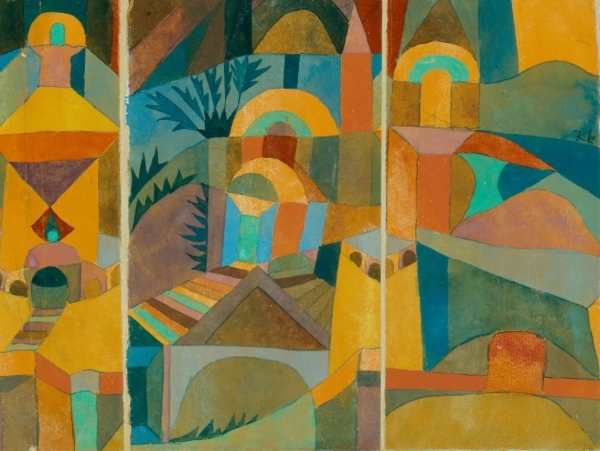 Paul Klee’s Temple Gardens (above) is part of the exhibition at the National Gallery. November 16, 2018 to March 17, 2019. Colours and shapes and symbols, oh my! I have to get moving on this one if I want to catch it before it closes. D. and I have it penciled in for next weekend. May 24, 2019 to September 8, 2019. It’s Gauguin. And portraits. ‘Nuf said. Until April 14, 2019. I follow the Canadian Museum of History on Facebook and keep seeing images from this exhibition in my feed. I know nothing about Canadian photographer William Notman, but I am drawn in by his work. Therefore, it goes on the short list. August 25, 2018 to April 7, 2019. I’m intrigued by the time period covered by this exhibition (the 1960s) and by one of the pieces featured on the website. The piece is by Marcelle Ferron, a Québécoise painter associated with a group called the Automatistes. Back in January when D. and I visited the Musée national des beaux-arts in Québec city we saw several paintings by some of her male counterparts, but alas, I don’t remember seeing any by women. Here’s my chance. Also, I’ve been wanting to visit this gallery for a while now so… short list. December 16, 2018 to March 17, 2019. OK I’m not sure if I’ll make it to this one because there are only so many museums I can visit between now and mid-March, but an exhibition featuring antique and vintage toys? That’s short list material whether I manage to see it or not. June 14, 2019 to September 15, 2019. If I can’t make the vintage toys exhibition, maybe I try to make this one. It speaks to my love of images and nostalgia. Yours truly climbing the stairs up to the Musée national des beaux-arts du Québec’s Pierre Lassonde pavilion. Photo by D.
May 30, 2019 to September 8, 2019. How often do we get to see a collection of Miró pieces in our neck in the woods? Not very often, which is why this one’s on the list. Plus, D. and I visited this museum for the first time in January and were absolutely smitten with its spaces. If you’ve never been I highly recommend a visit. July 13, 2019 to January 5, 2020. I’m not a huge horror or sci-fi fan and full confession: I didn’t know who Kirk Hammett was until I read the description. I still think this is cool. And I think D. would get a kick out of it. So many of our art adventures are Stephanie-focused, here’s one for you D.! Et voilà, my short list for the year so far. I rarely make it to all of them, but a girl’s gotta have some goals, yes? For the record, there are many other exhibitions on deck in and around Ottawa that are not on this list. You might want to check out the new Ottawa Art Gallery (OAG) or Toronto’s Art Gallery of Ontario (AGO). If art’s your thing, I encourage you to take a look at the websites and tally up what speaks to YOU.